Day 93 -- Merry Christmas, Auroara! "Auroara"?? It was a big, busy day for the pack, both human and canine. There was breakfast to enjoy, presents to open, dinner to prepare, friends to enjoy, and occasionally a moment to play with a puppy. For her part, Aurora did a good job exhausting herself with the early morning play session. By the time serious cooking or serious present opening started, she was into a deep nap! The development in the puppy world today was reading her signature on the Christmas cards. Apparently, she is spelling her name Auroara. We don’t know if the non-standard spelling will stick. Geoffrey’s family has a history of unique name spellings that do last though. Just consider his brother Richard, aka: Ric. Personally, I like that her name might contain a mention of her ROAR. Anyway. The guests and the girls made a wonderful Christmas for all us Ozdachs. 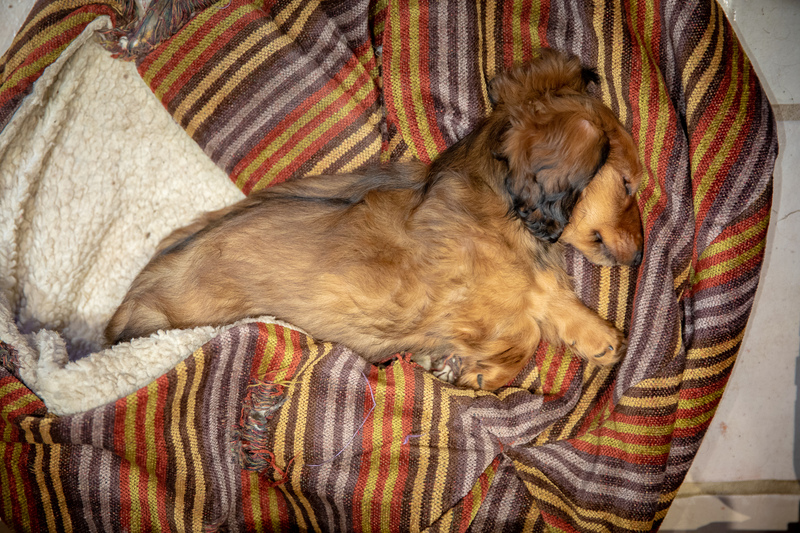 This entry was posted in dachshunds and tagged Auroara, Aurora, Christmas 2018, dachshunds, hide-a-pet, puppies2018, zenith puppies. Bookmark the permalink.